This week I'm going for two challenges in one. This is my first entry for the Caardvarks blog whose challenge 'Colour It' links nicely with ABC's 'I for Indigo'. 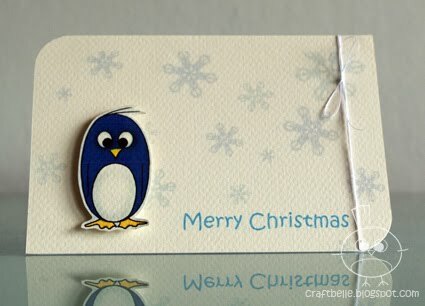 So, here is my Indigo penguin (which I think looks great in blue). I've popped him up with foam stickies on some homemade snowflake paper. And finished it off with a Christmas sentiment and a bit of white floss. If you'd like to make your own snowflake paper you can download the transparent gif 'free' from my Download Page or see sidebar. Also, to celebrate my new illustration set 'Birds Of A Feather' at squigglefly you can pick up a pre-coloured clipart version of Penguin too. What an adorable little card!! I love the clean design, and that cute penguin! Great job with the Caardvarks challenge! Such a sweet card...thank you for joining us at A B C..